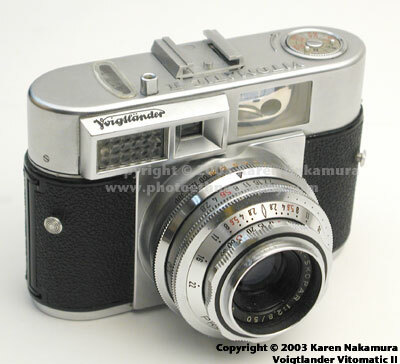 The Voigtländer Vitomatic II is a 35mm coupled-rangefinder camera made by the Voigtländer division of the Zeiss-Ikon conglomerate in the late 1950s. Although designed for the consumer market, the Vitomatic II featured both a coupled selenium cell reflective light meter and a coupled rangefinder. Using the text or images on this website without permission on an ebay auction or any other site is a violation of federal law. I bought this camera at the annual Omsted Gold Rush antique festival in Rochester, MN. The Gold Rush is apparently the 2nd largest antique festival in America. I also picked up a Yashica GS, a Polaroid SX-70, and a very nice rangefinder/lightmeter. 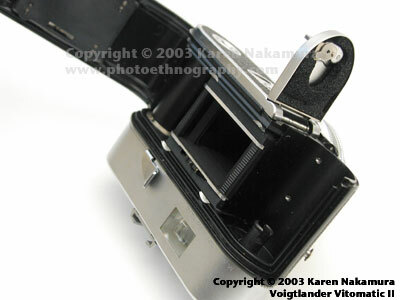 McKeowns says that the Vitomatic were the last of the classic Voigtlander cameras. 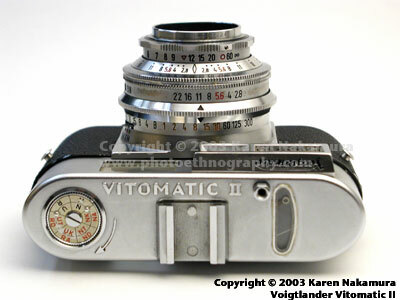 The Vitomatic II is the Vitomatic I with a coupled rangefinder. Rather than using cloth focal plane shutters, the Vitomatic II uses a Prontor leaf shutter design for the shutter. This allows the camera to flash sync at all speeds. I personally like leaf shutters and don't mind that the top speed is limited to 1/300 sec. rather than the 1/1000 available in the focal plane shutters of that era. But then again, I'm an anachronism myself. Using the text or images on this website without permission on an ebay auction or any other site is a violation of federal law. The camera comes with the original Voigtlander case. Like most Voigtlander cases of that era, the case is much worse shape than the camera, which has stood the test of time well. Winding mechanism: It sports a regular thumb winder but winding the camera apparently has no effect on charging the camera. Is the camera broken? There's no charging lever on the shutter either. Hmmm... might as well throw it in the junk bin..... No wait! This camera is one of those annoying cameras where the film sprocket holes charge the shutter. So if there's no film passing through the camera, the shutter never gets charged. Rotating the sprocket holes manually, you can charge the camera to dry fire it. Using the text or images on this website without permission on an ebay auction or any other site is a violation of federal law. 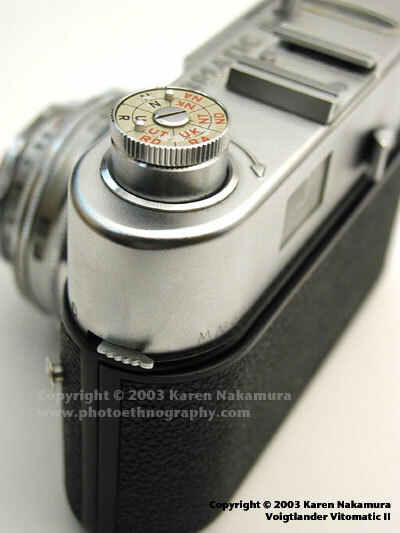 The rear back is a conventional hinged back like every other modern 35mm camera except the Leica M series. But... to open the back, there's a small drop down door (see picture). It's very very cute. Before opening the back you have to wind the film back into its canister. Hmm... where the wind lever? Pushing a small hidden button pops up the winding knob which is flush with the top. Film counter? The design of the top of the camera is very modern with clean lines, so clean that there's no film counter visible... hmm... Oh! The film counter is on the bottom. The leather case even has a cut-out for it. Cute! Locked aperture/shutter. The shutter and aperture dials are locked so that you can adjust them in conjunction with each other to take advantage of film reciprocity. An early version of "auto-program" aperture/shutter selection. But there's no EV system numbers indicated, since the meter is fully coupled. Neat! The lugs on the sides of the camera are for a camera strap, but they seem difficult to use and I'd be worried the strap would fall off them. Above the lens selenium cell. 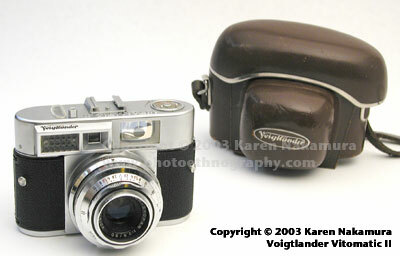 Voigtländer is one of the oldest names in camera history. It was founded in 1756 to produce optical instruments, from 1840 it started to make cameras and lenses. 1902 saw plate cameras. The Schering Gruppe takes over Voigtländer in 1924, then the Zeiss Ikon conglomerate took it over in 1956. 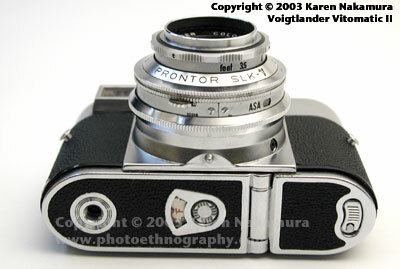 In 1970, Zeiss Ikon and Voigtlander merge fully with Zeiss building cameras and Voigtlander only the lenses. In 1974 Rollei acquires the name with Voigtlander shutting down the next year. In the 1990s, the Japanese company Cosina licenses the name from the owner (Ringfoto) and produces a series of 35mm Leica-copy rangefinders and lenses under the Voigtländer marquee. Zeiss: Zeiss Ikon was formed in 1926 out of the merger of five companies: Carl Zeiss/Jena A.G., ICA A.G., Erneman A.G., Goerz A.G, and Contessa-Nettel A.G. Zeiss-Ikon was a huge corporation with offices in five cities in Germany and it offered a huge variety of cameras. Unfortunately, that was also its downfall. Various divisions competed against each other horribly and there was much, much reduplication of effort. It never really took advantage of its size. Carl Zeiss, the main company, can actually trace its roots to 1846, to the very dawn of photography and is renowned for such designs as the Tessar and T* coating. Even now, Carl Zeiss lenses grace the very best cameras from Contax to Hasselblad. Last modified: Thursday, 11-Mar-2010 01:09:46 EST , [an error occurred while processing this directive] .